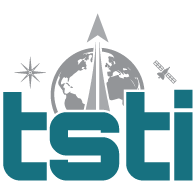 This space training course provides the conceptual framework for developing human space missions starting from a blank sheet of paper. 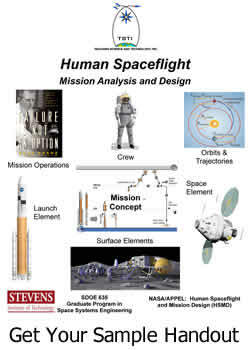 It describes and teaches the manned space mission design and analysis process. The entire course is process oriented to equip each participant with the practical tools to complete a conceptual design and analyze the impacts of evolving requirements. The content is presented in a 13 week format with detailed homework sets in a design exercise format to give first-hand experience with the techniques presented. This course is designed for program managers, engineers and scientists who need to understand the complete process involved in designing human space missions. Explain basic principles of orbital mechanics and how they apply to human missions. Apply these principles to calculate and analyze trajectory and orbit maneuver options for different mission concepts. Describe and apply space element architectures, design and sizing principles and processes for on-orbit, ascent and re-entry operations. Apply sizing principles to estimate mass and power for a given set of requirements. Characterize the scope, functions and physical architecture options for human spaceflight support systems such as Environmental Control and Life Support, Thermal Control, EVA Systems and others. Apply sizing principles to estimate mass and power for a given set of requirements. Operations Planning; Command, control and communications (C3); Logistics; and In-situ resource utilization (ISRU). Interested in this engineering training course?